I found this photo on the Steam into History Facebook page. I thought it was a great depiction of a civil war era railroad scene as there are no anachronisms visible. Well, maybe just three. Can you find them? Updated: Of all the comments below, no one picked up on the steel joint bar. In the ACW joint bars were made of wood. 3, Air hose and air compressor. ACW era trains did not have air brakes. 6. Camps chairs may be too modern. Steam into History is a nonprofit, educational, charitable organization. They operate a steam train that chronicles the role York County, PA. played in Civil War history. 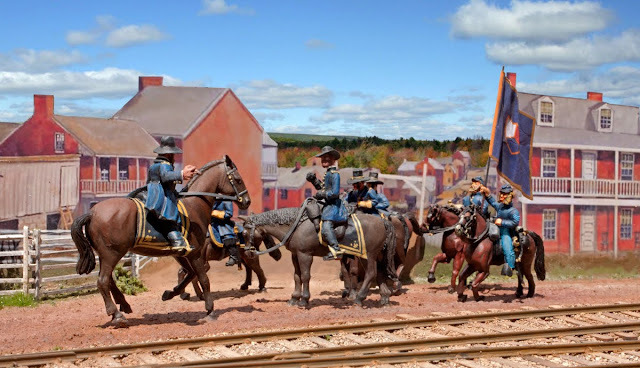 They are holding an event this weekend to recreate a confederate raid on the railroad. There is more info at this link. In between golf, chores, and binge watching Game of Thrones, I did an update to the Revised PoLA plan based on some feedback from the client. He plans to reuse an existing staging level with a helix. Since he already had those built, it wasn't a big deal to modify the plan to include them. He also asked to include the option to include some ship models on the layout. Finally, he asked for suggestions on what to include in the second room, which the first design listed as future expansion. This version reflects those changes as well. 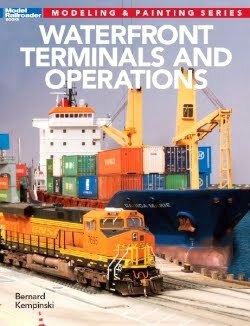 One of the readers of my book, "Waterfront Terminals and Operations" asked me if I could develop a modified plan of my PoLA layout to fit his space. He was currently modeling a plains railroad in HO scale but was unhappy with its design. In particular he felt he had tried to cram too much stuff in his layout. He liked the PoLA design for its operation potential and manageable scope. He also requested wide aisles to ease access. He has two rooms available for his layout with an assortment of doors and windows. The overall space is 31 by 15 feet with a few obstacles here and there. Here is the plan that I developed for his space. It's an enlarged version of my own plan with longer sidings and a few extra industries. Initially his back room is reserved for staging, but the layout could easily be expanded in that space later with some of LA's shoreside industries. This layout supports a lot of varied operation. There are industries for tank cars, auto racks, covered hoppers, box cars and a break bulk terminal that can accept just about any type of car including double stacks, gondolas, depressed center flats, steel cars, etc. The long sidings add interest to the operation especially when combined with industry spot numbers. For example, switching the single siding at Vopak can be quite involved when cars have to be placed at specific spots. Some of the sidings are quite long, in contradiction to normal model RR design practice where designers try to cram more, but smaller sidings into a design. I don't like that approach. First, most of the industries on a modern layout have long sidings to provide the rail transportation service they require. Otherwise, they probably use trucks. So designing a layout with longer sidings is prototypical. Secondly, switching long cuts of cars on a layout feels more prototypical than the usual one car out-one car in used on some layouts. It requires good engineer - brakeman coordination. It also presents an imposing spectacle. Watching a string of 15 auto racks going in and out of WVL is really cool. See the video below for an example. The same concept would apply when switching Pasha, where there are 4 parallel long sidings. This could almost quality as a model railroad yard. Switching this industry can be akin to working a yard with sorting and blocking. The operation can be made even more involved if some cars on the long sidings must remain, while other cars deeper in the siding must be pulled. I do that on my layout when I have more advanced operators to make the tasks more interesting. I was looking through my old photos and thought this one would benefit from some clean up in Photoshop. So here it is. The Lyceum has opened it's exhibit on Alexandria in WWI. My mom and I stopped by today to get a look at it. The exhibit has an interesting array of artifacts. While I am proud that the sub chaser model I built is prominently displayed, the exhibit that I find the most amazing is R. Fawcet's chest. He was the first citizen from Alexandria to die on the war in an flight training accident in Illinois. The military shipped his belongings home in a footlocker just as he had left them. The Fawcett family kept the chest for 100 years and left it unopened for 80. It was quite moving to see the man's uniforms, texts and personal effects largely untouched 100 years later. Alas, I didn't take a picture of the footlocker. used in filming PBS's TV show "Mercy Street"
The WWI weapons are on loan from the NRA Museum.